FERRARIO - [ Captain Cook's arrival - Hawaii ]. FERRARIO, G. - [ Captain Cook's arrival - Hawaii ]. [ Captain Cook's arrival - Hawaii ]. - FERRARIO, G.
Title : [ Captain Cook's arrival - Hawaii ]..
Map maker : FERRARIO, G.. Size : 6.7 x 8.1 inches. / 17.0 x 20.7 cm. Colouring : In attractive strong original colours. 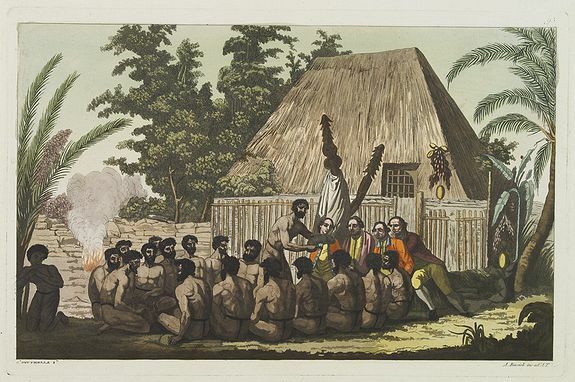 Description :Aquatint depicting a group of Hawaiian people honoring and welcoming Captain Cook's arrival in front of a sacred edifice. The Sandwich Islands was the name given to the Hawaiian Islands by Captain James Cook on his discovery of the islands on January 18, 1778. The name was made in honor of one of his sponsors, John Montagu, 4th Earl of Sandwich, who was at the time the First Lord of the Admiralty and Cook's superior officer. During the late 19th century, the name fell into disuse. From Giulio Ferrario's work Le Costume Ancien et Moderne ou Histoire du gouvernement, de la milice, de la religion, des arts, sciences et usages de tous les peuples anciens et modernes d'après les monuments de l'antiquité et accompagné de dessins analogues au sujet par le Docteur Jules Ferrario. Asie IV.me Vol". Published in Milan by the author between 1816 and 1827. This aquatint engraved plate was color printed on fine move paper with additional hand-coloring. Condition : Very good condition.